No bones about it, every dog has unique needs. Here at The DogSmith we recognize that dog training programs need to be developed around the needs of the dog and the owner. We offer a selection of in-home private training lessons and dog behavior counseling services. Benefit from pre-paid training packages! If you are too busy then leave the training to us by selecting our ‘Latch-Key’ or ‘Board & Train’ packages. Get the dog training you need, whenever you need it! Your local DogSmith will meet with you and your dog, discuss your training concerns and build a training program around your goals. For each behavior we establish a training goal. That way we can measure how we are doing and how well your dog is progressing. Private training clients receive FREE copies of our DogSmith MTR® training cards. A One-On-One Behavior Consultation – Behavior consultations are for owners who have dogs with specific behavioral challenges such as fear, anxiety or aggression. Learn more about Behavior Consultations here. In-Home Pet Dog Training – In-home pet dog training lessons are for owners who do not find group classes to be a viable option. Pet Dog Selection Consultation – A 1-hour consultation to assist a family find their new pet dog, based on the family’s preferences and lifestyle. ‘Puppy Pack’ Programs – The DogSmith has developed Puppy Training Programs that provide you with everything you need to take you from ‘cute and cuddly’, through the ‘terrible twos’ , all the way to ‘best friend.’ Click here to read about our Puppy Packages. DogSmith Puppy Solutions – A series of six In-Home lessons for you and your new puppy. This course covers basic puppy skills, puppy development, house training and crate training. In-Home Pet Dog Solutions – A series of eight in-home lessons for you and your pet dog. This series is customized around the specific skills you would like to learn. Busy Schedule – Leave the Training to Us! DogSmith Dog Training Board & Train Packages – Your dog can stay in the home of a certified Dog Trainer and will receive a minimum of two hours training each day. The remainder of the dog’s time will be spent with the Dog Trainer managing their new and (possibly) unwanted behaviors through interaction and play, and enjoying a family environment. 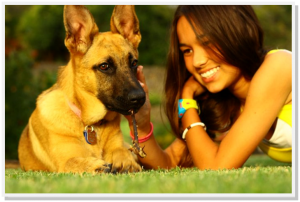 Latch-Key Dog Training – While you are on vacation a DogSmith certified Dog Trainer can care for your dog in your home and train your dog. 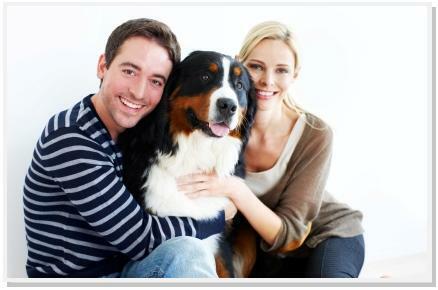 Alternatively, a DogSmith certified Dog Trainer can visit your home daily or on an agreed schedule to train your dog.